The Federal Reserve’s balance sheet has ballooned to about $4.5 trillion, as of December 31, 2016, thanks to years of quantitative easing. In the aftermath of the 2008 financial crisis, the central bank began purchasing troubled assets — such as long-term Treasuries and mortgage-backed securities — to provide banks with capital for lending and acquiring other assets. The $4.5 trillion in acquired assets is about four times the pre-recession average. With the economy improving, the central bank indicated that it may start unwinding its balance sheet, although the timetable remains uncertain and there’s no consensus on how the operation will be carried out. The central bank aims to quietly operate in the background over the next several years with a minimal effect on financial conditions, while paring down its balance sheet to lower levels that remain larger than prior to the financial crisis. In this article, we will look at the impact of the central bank’s unwinding efforts on monetary policy, asset prices, and international markets. 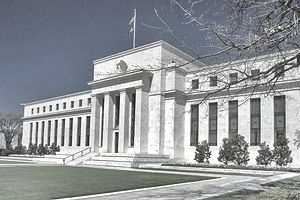 The International Monetary Fund (IMF) believes that the unwinding of the Federal Reserve’s balance sheet will have a relatively small effect on monetary policy. As such, the institution recommended unwinding the balance sheet independent of changes in the federal funds rate and in inflation and employment outcomes unless the economy experienced a significant negative shock that would justify otherwise. The small effect on interest rates means that international markets won’t face any immediate headwinds associated with rising interest rates. For example, many emerging markets hold dollar-denominated debt with payments tied to interest rates. The modest and steady increase in interest rates helps ensure that these companies have ample time to prepare for greater debt service payments without any sudden financial shock. The unwinding of the Federal Reserve’s balance sheet may have a negligible impact on the central bank’s overnight interest rates, but it could have a big impact on stocks, bonds, and other assets. After all, these assets are driven more by perception than reality and the perception of a slowdown in government bond and mortgage backed security purchases could lower the prices and increase the yield of these instruments. Rising government bond yields could have several different effects on the markets. For example, these benchmark bonds are typically used to set the so-called “risk free” rate when it comes to equity valuations, and a higher risk-free rate could translate to lower asset valuations. Higher yields could also hurt interest rates that are set based on these benchmark bonds, including mortgages in the United States or overseas rates. Higher yielding U.S. government bonds could also draw capital away from emerging markets and other global economies. After all, an investor evaluating U.S. bonds and emerging market bonds with similar interest rates may choose U.S. bonds due to their lower risk. Emerging markets may have to respond by increasing bond yields, which would result in a decrease in bond prices, particularly in interest rate sensitive markets. The Federal Reserve’s plans to unwind its $4.5 trillion balance sheet is expected to have a modest effect on interest rates, but it could have a big impact on the valuations of stocks, bonds, and other assets. Domestic and international investors should be mindful of these risks as the central bank makes its plans clearer down the road, although the effects could be minimal if the unwinding process goes according to plan. In 2013, Chairman Ben Bernanke suggested that the central bank may slow down the pace of its bond purchases. Investors responded by sending bond yields sharply higher and sending stocks down about 5 percent in June in what eventually became known as the “taper tantrum”. The central bank hopes to avoid these problems by slowly unwinding the purchases in a very predictable way, but there is no precedent for investors to follow and the reaction is uncertain. Investors can hedge against this uncertainty by ensuring that their portfolio is properly diversified – especially fixed income portfolios that may be most vulnerable.